…I love making pastry, but just wasn’t up to waiting an hour for it to rest in the fridge so opted for the ready made pastry sheets. No rocket science here…my friends..just making good use of pre-canned, pre-cut, pre-made…and the test kitchen is in business. And as you can see, the results were fantastic, a beautiful crusty rustic pastry, with the glorious ‘beefy’ plump taste of cherries and mixed sweet fruits. Preheat oven to moderate temp 180°C. Line with baking paper a loose – bottomed tart tin, or ceramic pie dish. With first sheet of pastry ( my sheets were square) cut to measure the base size of the tin, with second sheet cut four equal strips of about 3cm in width and do the sides of the dish. Line the pastry with foil and fill with pastry weights ( dried beans or rice will do fine) and blind bake for 20 minutes. Remove the foil and weights, prick the base of the tart with a fork and bake for a further 8 minutes. Take out of oven, lightly beat egg and brush the pastry case lightly. Return the tart to oven for a further 2 minutes to seal and then set aside. Lets move onto the filling. Drain both the canned cherries and mixed berries, put into bowl and combine gently, avoid breaking up the fruit. Add the zest and juice of the lemon and icing sugar, let rest for a couple of minutes. Tip the fruit then into a colander and drain away any excess juice. This is the secret of no more mushy pastry bases, and a luscious fruit filling..we’re not making jam here…see how the fruit is still in pieces. …to make that tart filling glow, plump up without all that extra juice. 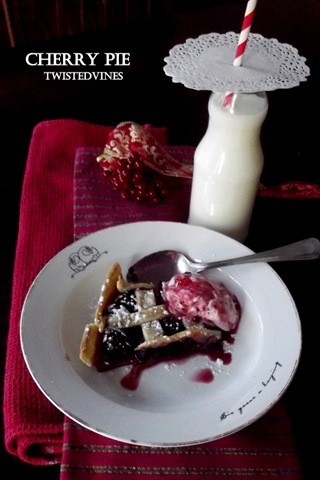 Sprinkle the fruit with the cornflower, just give it a shake and pile into the tart pastry shell. With the third pastry sheet,weave pastry strips of a 1cm wide forming a lattice, brush the top pastry strips with the egg wash, sprinkle with brown sugar and bake for 20 minutes, or until pastry is golden brown. 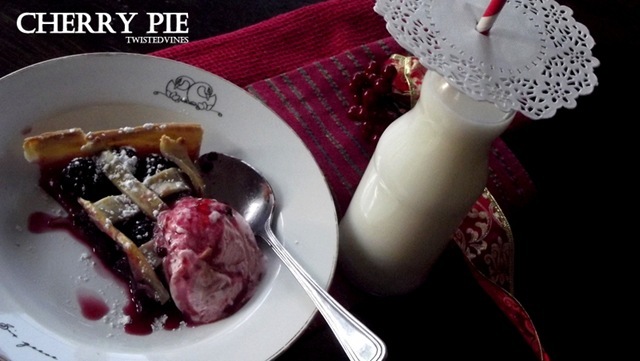 Leave to cool, serve with strawberry ice cream and a sprinkle of icing sugar. YUM! 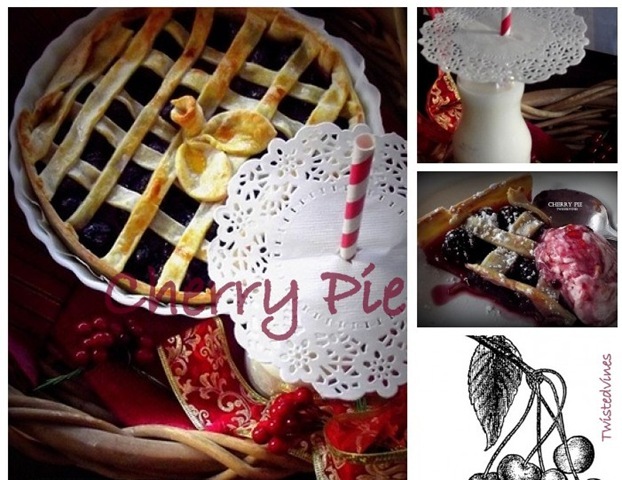 I love cherry anything and this pie looks divine! The second pie mosaic I’ve visited. Now I am really craving one and must get in the kitchen tomorrow morning. Yours looks yummy and I often use the Pillsbury pie dough from the dairy section. 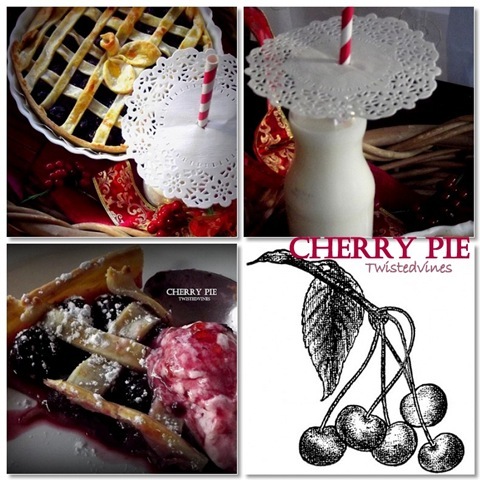 Your pie looks delish, and cherry is one of my favorites. Maybe it’s about time to make a pie, it’s summertime. Well not officially but the temps here say it is. Oh, so yummy-licious, Yvette! It looks beautiful, too. Now I want some berry pie. I’ve never thought to add berries to a cherry pie but now I cannot wait to give it a try. Sour cherry season is just around the corner and what better way to celebrate? Of course! A bit of strawberry ice cream! You really do think of everything, Yvette! Always a pleasure having you visit Pat, a first timer for me making this cherry pie. I guess the sign of an empty plate means all signs good! It looks delicious! I love your pics, they are beautifully styled! I’m sure sour cherries would work, this technique of coating the fruit with cornflour(cornstarch) ensures the fruit stays whole, and ensures theres just enough sauce…. make sure all the excess liquid is drained first, and there won’t be an overpour of syrup. 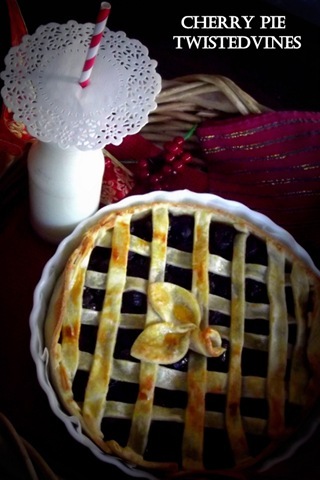 Your pie is just gorgeous! oh yummy…i think i shall make one this weekend! 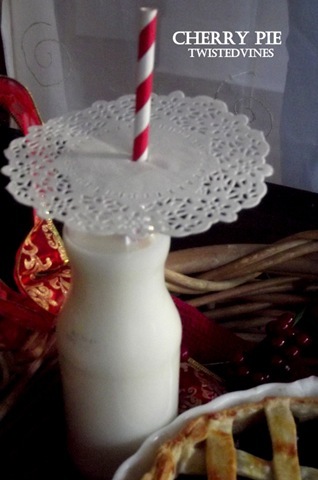 and i love your cute little bottle of milk with the pretty doily and straw! pretty presentation! 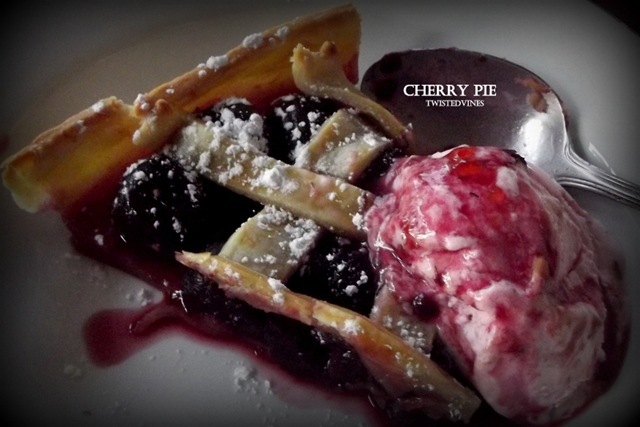 I love cherry pie — and I love how you’ve presented your masterpiece! Beautiful.